HEEL – To walk calmly at your left side, pacing himself to your speed, enjoying the scenery, but paying attention to you. AUTOMATIC SIT – To automatically sit at the heel position when you stop. SIT – To sit instantly on one command. DOWN – To lie down instantly, either near you or from a distance, on one command. STAY – To stay in a sitting, lying or standing position on one command. COME – To come instantly on one command. FINISH – To heel and sit at your left on one command. STAND FOR EXAM – To stand motionless while being examined on one command. Behavior problems such as jumping up, biting, chewing, digging, barking, fighting, separation anxiety, etc. are addressed in class. Your dog must be at least 6 months old and we recommend that he is current on all vaccinations. 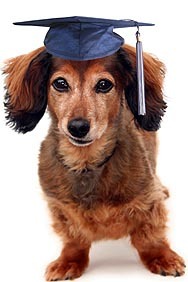 Obedience Class Schedule - 2019 Calendar for Summer and Fall. Each date/time listed below is a separate class and each class will meet once a week for 2 hours for 9 weeks, starting on that date and meeting weekly at that time. All classes are FULL when 30 students are enrolled, and I will likely cancel any class if enrollment is less than 20 students. I will reply to your registration by email, and then I will contact you again before classes begin, by email and a phone call. This is serious training so please only enroll if you are committed! Please pre-register for the class you want, and please also choose a 2nd option, just in case your 1st choice class is FULL. When you register, please also email me a photo of you and your dog, so I can begin learning your names, and so I can make a name badge/lanyard for you! You may pay the first class, mail a check, or use paypal when you register. Once classes begin, all students are allowed to attend a different class time, if needed, each week. Ideally I want all students to have perfect attendance, so I encourage you to mix class times and "class hop" to accommodate schedule conflicts that arise now and then! You are also welcome to attend as many classes as week as you want for more practice with your dog!! Thank you for investing your time, effort and money into this amazing training program. It is a wise investment that pays wonderful returns! 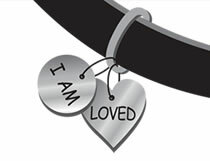 You and your dog will learn to enjoy the freedoms of OFF leash reliability and your bond will be even greater!! In addition to our Obedience Class, we also offer Puppy Classes and Aggression Problem Solving. See our Brochures section for more information.